Commissioned in the depths of the Great Recession, Federal Center South, the Army Corp of Engineers’ regional headquarters in Seattle, was funded by the 2009 American Recovery and Reinvestment Act. But stimulus money came with big strings attached—namely strenuous requirements that it had to be built very, very quickly and very, very sustainably. So as part of the design competition by the General Services Administration (GSA; the government agency that develops and builds government properties), this massive $72 million, 209,000-square-foot building had to be built in 31 months, from first sketch to the positioning of office furniture. Construction lasted only 26 months. And the design team, composed of the architect and contractor joined together in a design-build agreement, had to guarantee the building’s energy performance after only 10 weeks of design. “It took us half the time it would have normally taken us to go through a process like this,” says Rick Thomas, project manager with the GSA for Federal Center South. Exterior of Federal Center South. Courtesy Benjamin Benschneider Photography. BIM, post-occupancy studies, and purely passive energy-efficiency systems are what made it possible. As a result, the project received the 2015 AIA Committee on the Environment (COTE) Top Ten Plus Award—an incredibly prestigious green-building award because it requires submitted projects to demonstrate verifiable levels of building performance beyond completing construction. Architect ZGF and contractor Sellen Construction used BIM to move quickly and accurately, to deliver the project on time and on budget, at an ambitious level of energy efficiency. The team had to reach 27.6 Energy Use Intensity—an energy usage metric equal to the amount of energy used per square foot per year. If this performance goal wasn’t met, half a percent of their fee (approximately $400,000) would be kept if the project didn’t perform at the required level. Beginning in the 1930s, Federal Center South’s site had been a Ford factory, Army base, and a Boeing missile-manufacturing site, and ZGF and Sellen used BIM to untangle a web of discarded building foundations and leaking oil tanks in order to remediate this brownfield. 200,000 board feet of reclaimed timber was used throughout the building. Courtesy GSA. A wood warehouse on-site made of Douglas fir was deconstructed and used for timber cladding in Federal Center South’s expansive atrium. This rich-hued, unfinished wood defines the project’s regional identity as a product of the Pacific Northwest, and its reuse was key for conserving materials. ZGF and Sellen used BIM to create a road map of sorts to put this puzzle together. There were 200,000 board feet in all, with varying dimensions and amounts of rot and damage. 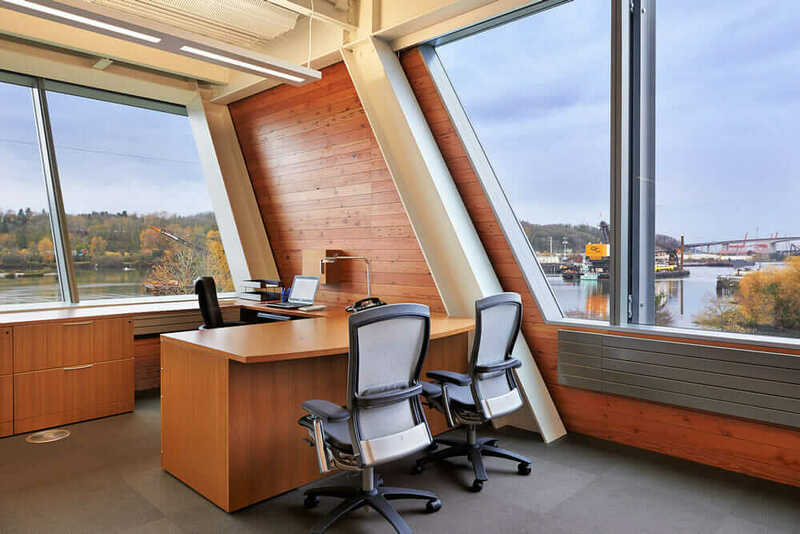 Using BIM, “we tagged every piece of timber we had with numbers, and where they fit into the building,” says Jack Avery, a senior vice president at Sellen. This level of granular detail is vital to Federal Center South. The project’s atrium is almost exclusively composed of structural steel beams, wood cladding, and glass skylights amid lush landscaping, creating an impressive civic space and a series of aesthetic contrasts. But it offers few finished materials to hide behind, placing all the emphasis on how ZGF’s kit of partially reused parts comes together. “The structure is the architecture,” says Todd Stine, a managing partner at ZGF. BIM also gave ZGF and Sellen the flexibility to add new sustainability features to the project while it was already under construction. A 25,000-gallon rainwater cistern and 150-foot geothermal wells were dug into the site. “Without BIM, I think the completion date would have slid with all these additions,” Stine says. 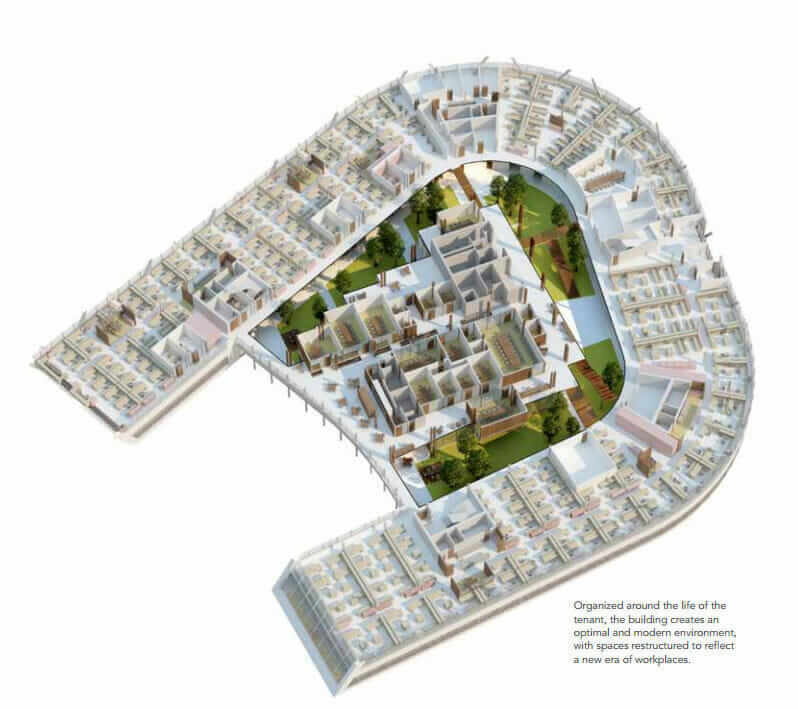 “[With BIM], we were able to explore more options quicker, and identify where potential issues were occurring quicker.” For the project, the team used Autodesk Revit Architecture, Revit Structure, Revit MEP, Navisworks, AutoCAD Civil 3D, and 3ds Max. The rainwater reuse system captures water from the roof and stores it in a 25,000 gallon cistern to be used for toilets, irrigation, a rooftop-cooling tower, and water features in the atrium. Courtesy GSA. In its research, the design and construction team realized that during a 25-year period, 90 percent of buildings’ costs are staff and operations, and only 10 percent comes from initial construction. So, while setting performance goals with BIM is important, ZGF and Sellen realized that arriving at a truly sustainable building is a journey that goes on long past the certificate of occupancy. As such, the architects assembled a wide array of energy-efficiency measures, and then deployed post-occupancy studies to fine-tune them. Beyond geothermal wells for heating and cooling, the facility offers a hybrid chilled-beam system and a roof-mounted, phase-change tank, both of which distribute cool air. Interior of Federal Center South. Courtesy Benjamin Benschneider Photography. The building is optimized for solar heat gain, and its thin, open-office floor plans allow lots of light to penetrate. 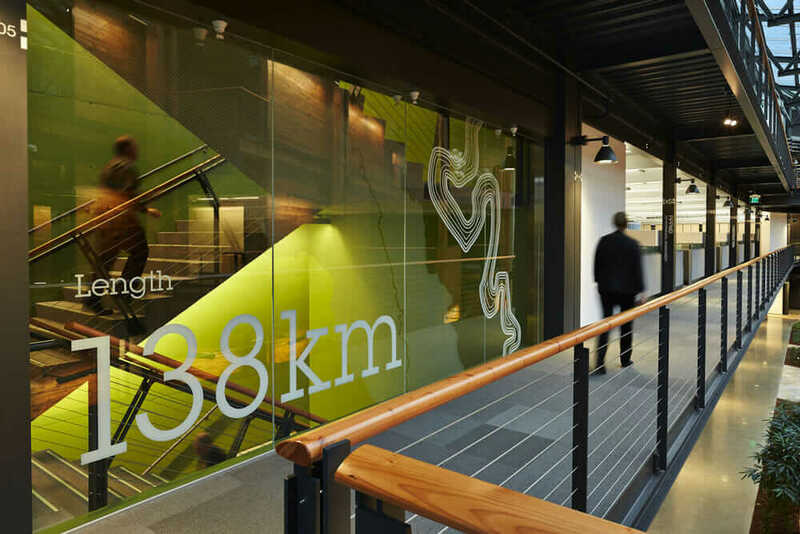 (BIM was used to model daylight levels, allowing 61 percent of the building to be daylit.) 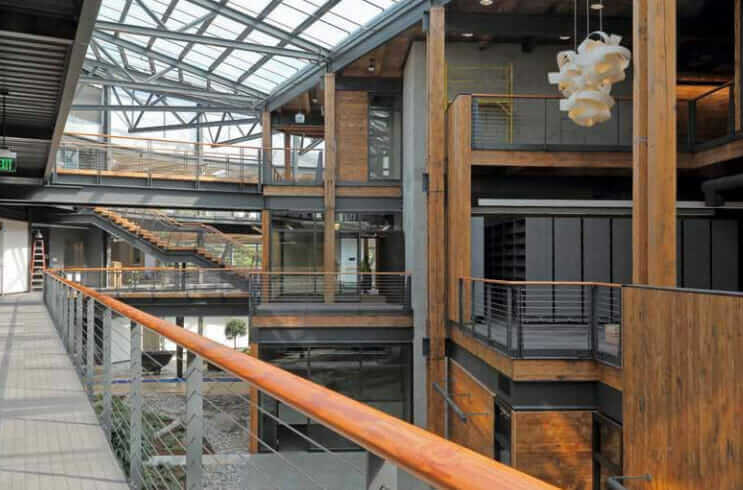 The office areas of the building wrap around the atrium in an oxbow shape, a reference to the adjacent Duwamish Waterway. 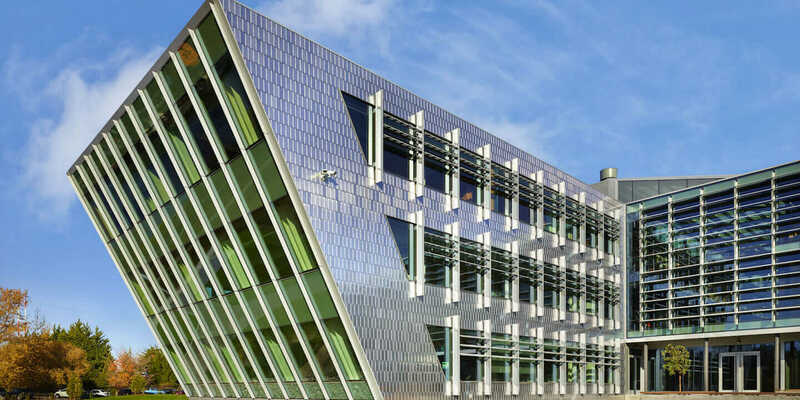 Its façade is composed of stainless steel tiles with a pewter finish, which shines in the sun like fish scales. “People think of Seattle as cloudy, and it is, and we’re still able to turn off the lights for a good part of the day,” Stine says. But, for the first four months of the building’s life, all these systems and design features failed to live up to the team’s performance goals, calling for a bit of post-occupancy detective work. Going system by system, ZGF and Sellen examined how each energy and HVAC system “talk to each other,” Stine says. They discovered that the boiler was turning on in the middle of the night for no discernable reason, and that motion-detecting lights were being triggered by security guards patrolling the building in the wee hours—issues that would have been difficult to detect without sorting through the mounds of data the building produced. Federal Center South corner office space overlooking the Duwamish Waterway. Courtesy Benjamin Benschneider Photography. 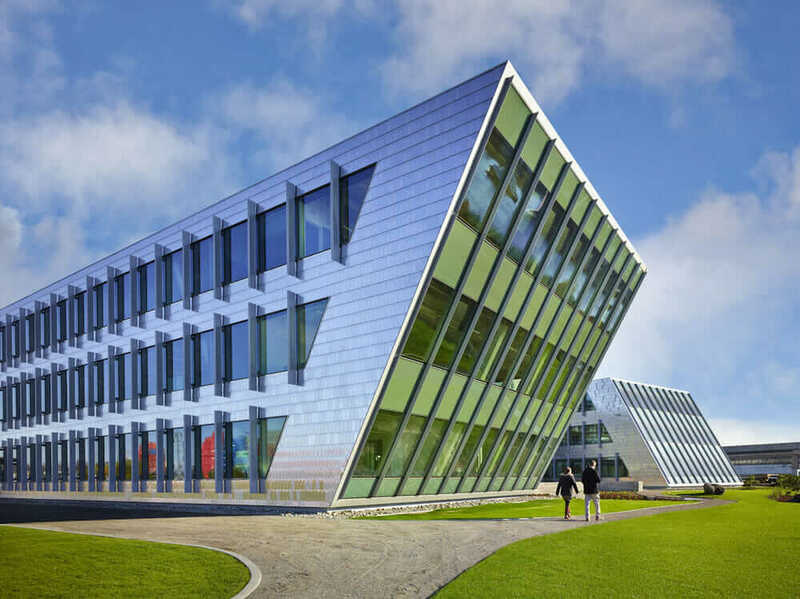 This conscientiousness paid off, with a LEED Platinum rating and the AIA COTE Top Ten Plus Award—the first building to receive this award that didn’t have any active energy-generation systems. Even with only passive energy-saving measures, Federal Center South uses one-third of a comparable building’s energy. This emphasis on passive energy-efficiency strategies over active-energy generation indicates a growing sophistication in the green building community. A decade ago, a project wasn’t sustainable unless it announced its intentions loudly, with flashy solar PV panels and wind turbines. Today, there’s a growing recognition that passive measures (optimal solar orientation, high-quality insulation, etc.) are the cheapest, most valuable, and lowest-hanging interventions for sustainable building projects. Cutaway floor plan of Federal Center South. Courtesy GSA. That’s something John Quale, an architecture professor at the University of New Mexico and 2015 COTE Top Ten Plus Award juror, understands well. He was also on the COTE jury eight years ago, when architecture was still enthralled with the idea that sticking a solar panel on a building always made it more sustainable. Federal Center South reminded him that, at its most fundamental level, sustainable design has little to do with bio-algae energy generation, Passivehaus insulation standards, or any other bit of green techno jargon. Sustainability begins with design, ends with verified performance, and requires constant questioning along the way. Really, a little bit of inquisitiveness goes a long way.